Cholesterol (also called lipids) is a type of fat that your body makes. We all need some cholesterol for important jobs like making hormones and cells. But we only need a small amount. High levels of cholesterol can clog up your blood vessels, which can lead to heart attacks or strokes. There aren't normal levels of cholesterol for everyone. The levels you should aim for depend on how high your risk is of heart disease or having a stroke. Find out how high your risk is by having a cardiovascular risk assessment with your GP or nurse. total chol/HDL ratio – less than 4. 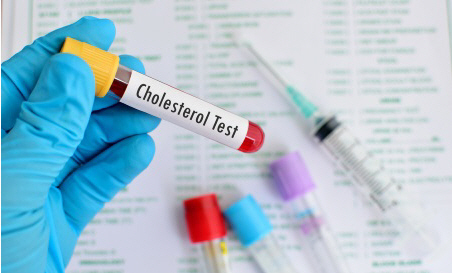 If you have heart disease, diabetes or peripheral vascular disease, or have had a stroke or TIA, it's important to try to keep your cholesterol levels within these ranges. If you have an increased risk of developing heart disease or diabetes, your GP may talk to you about ways to get your cholesterol levels near to these ranges. LDL: This is often called bad cholesterol. It takes cholesterol from your liver to different parts of your body. When there's too much of it, cholesterol can build up on the inside of your blood vessels. This makes your blood vessels narrow. HDL: This is often called good cholesterol. It actually removes cholesterol from your blood and tissues and takes it to the liver, which breaks it down and removes it from your body. If you have more of this type of cholesterol, you may have a lower risk of heart disease or stroke. Triglycerides: When we eat or drink, any energy we don't need to use immediately is stored in fat cells as triglycerides. If you regularly consume more energy than you need, you can get high triglyceride levels which can increase your chance of having heart attack or stroke. Total cholesterol/HDL ratio: This is a calculation used to figure out your risk of stroke and heart attack. The lower the number, the lower your risk. If you have high cholesterol but don't have any other risks for heart disease or stroke, you may not need any treatment. But if your cholesterol is very high (more than 8 mmol/L) you will need to discuss this with your GP or practice nurse, even if you don't have other risk factors. If you have had a heart attack, stroke, or have peripheral vascular disease or diabetes, your GP or practice nurse will want to talk to you about reducing your cholesterol. If your triglycerides are high, you should have them checked with a fasting blood test. If they stay high, you will need to make changes to reduce them. You may be able to reduce your cholesterol and triglycerides by eating and drinking for a healthy heart and being physically active. Stopping smoking and cutting down on alcohol help to lower your cholesterol levels. Reducing alcohol is particularly important if you have high triglycerides. If these lifestyle changes don't decrease your cholesterol levels, your GP may recommend you take a tablet called a statin. Statins reduce your cholesterol levels and reduce the chance of you having a heart attack or stroke. If you have had a heart attack, TIA, stroke, peripheral vascular disease or have a high risk of having these, a statin is recommended even if your cholesterol is normal. You can read more about high cholesterol, high triglycerides, and healthy eating and weight. Talk to your GP or practice nurse for more advice about high cholesterol, a healthier lifestyle, and whether you should repeat the blood test.